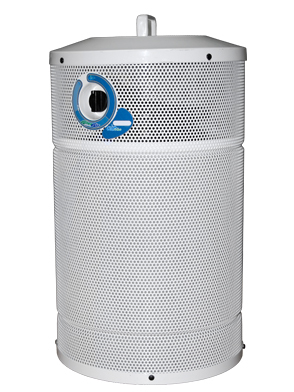 A Reliable, Affordable Compact Portable Small Room Air Purifier with True HEPA and 7 lb Activated Carbon for Removing Dust, Pet Dander, Chemicals & Light Odors in Small to Medium Rooms and Offices Up to 300 Square Feet! Small rooms and offices often accumulate higher concentrations of chemicals odors and particles simply because there is less space for the pollutants to spread out. Most cheap portable air cleaners, however, don't have the right type of filters to be able to effectively remove the various chemicals, particles, mold spores, etc. Sizing the air cleaner to the space is very important as too little airflow doesn't remove the pollutants fast enough and too much airflow can cause chemicals to blow right through unremoved. For rooms in the 187.5 to 300 square foot range, 100 CFM is perfect. And with an air cleaner like the AirMed 1 Supreme Exec with true medical grade HEPA and 7 lbs of quality carbon, you can truly improve the quality of the air you're breathing. With 100 CFM and 187.5 square feet, for example, the AirMed 1 Supreme Exec can cycle all of the air in the room through the filters 4 times per hour, enough to quickly reduce particles, chemicals and odors. And 100 CFM is just the right speed for this size room, to allow the chemicals enough time in contact with the heavy duty carbon filter. This is how carbon removes chemicals and odors--by chemicals or odor molecules electrically 'sticking' to the carbon surface. With slower air speeds, you get good removal of odors and chemicals, while also keeping noise to a minimum. 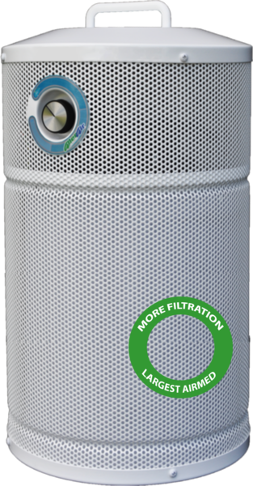 The 7 lb Exec blend carbon filter can remove a wide range of chemicals (over 4000 different types) as well as cigarette or marijuana odors, light cooking odors, many pet odor and other organic odor types--and last much longer than many other carbon air cleaner filters. With the medical grade HEPA filter, you're also removing over 99% of dust, dander, mold spores, even bacteria so you can stay well. If you're looking for an affordable, quality small room air purifier with high quality filters, proven performance and a best in class 10 year warranty, the AllerAir AirMed 1 Supreme Exec is a great choice. 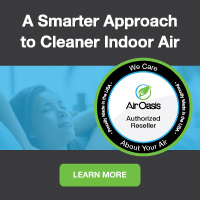 Order yours here at the best possible discount price and feel the difference truly clean air can make.